If you are a big-screen gamer but your budget doesn’t allow you to go for a widescreen TV or gaming monitor, a projector will be your last resort. These gadgets offer a cinema-like experience that adds thrill to your once dull gaming sessions on your laptop screen. Unfortunately, there is this wrong perception that they are dearly expensive. Yes, they are considering some even retail at over $1000 but what you need to know today is that you can still get a good projector that can still play AAA titles with just $100 or even less. I know it sounds unreal and in case you have been a doubting Thomas, you just came to the right place. We have tested several of them and finally came up with a final list of the best you can get when on a budget. That said, let’s go straight to business. This projector sports a sleek and compact design that can be easily carried and installed almost anywhere. Even though it has 1600 lumens only which is quite low for the best viewing outdoors, the 50-inch to 130-inch projection distance from a distance of 5ft to 13 ft. makes it a great projector for backyards and large gaming rooms. It has a native resolution of 800 x 480p and can support up to 1920 x 1080. I particularly liked the quality of PlayStation 4 via HDMI. Regarding input/output, it has an SD card slot, HDMI in, USB in and VGA. Unfortunately, it had problems reading USB 3.0 and Chromecast. Another thing I liked is how the sound was. I never imagined that such a compact and cheap projector would offer enough sound for titles that don’t require advanced sound. When playing FIFA, you can clearly hear the player calls, the net shaking after scoring and most importantly, the fans chanting. However, in higher AAA titles, sound doesn’t come out in the same way it would with a good sound system of headphones. With a 30,000 hours lamp life and a 1-year warranty, this is a great purchase for gamers who play in large rooms or outdoors in the backyard courtesy of its long throw distance. Unfortunately, if you want to depend on it for other entertainment like USB playback or connecting a TV stick, it might fail you! This is another great projector that I have personally owned before trading it off when I discovered Dr. J. What enticed me is the $80 dollar price tag. I had a budget of $100 and I had a few bucks left which I got a screen for better image rendering. It has been built with a native resolution of 800 x 480 but can support full HD content too even though it focuses on the top more than other areas. Just like RAGU, this projector is great for those with large gaming rooms because of the throw distance. You can project a screen size of 37 – 130-inches from a distance of 4 ft to 12 ft. However, its performance outdoor is better than RAGU as it has 16700K richer color. One thing I still regret losing is its Keystone. It is very easy to use and makes adjustment easy compared to other projectors that I have used. Perhaps the best thing about it is in terms of connectivity. If you want a versatile projector, this should be on your wish list. Besides gaming, you can watch movies on the USB or even connect a TV stick. I tested my Chromecast and it worked just fine. However, what I feel should have been included is a speaker. Even if it would have been a low-quality speaker, it is better than none. I really liked this projector because of its affordability. Besides, it delivers deep colors and plays a wide range of multimedia. The only problem is that it doesn’t have speakers but a sound output is available. Another great projector that should be on every big screen gamer’s wish list is Crenova XPE460 that can support wireless function with a dongle that can be bought separately. I bought it on Amazon during last year’s Black Friday on a 30% discount but unfortunately, I don’t use it very much because it tends to overheat on long use. However, when it comes to its picture quality, it is really impressive considering it comes with square pixels technology that reverts true color and reduces jagged edges. Besides this, it is 20% brighter than your average 1200 lumens projector. With 1080p content, it delivers better picture quality than what you’d expect after it has been downscaled. Another thing I liked is the customer support. My unit didn’t come with an HDMI cable and from Amazon’s product pager, it ought to have one. I contacted their support and in 4 days, my HDMI came at no extra cost. The support was also helpful when I got stuck trying to use the wireless feature. The only problem with this gadget is its operation noise because of the fan that is always overwhelmed by heating. If you want the best picture quality, then XPE460 is what you should get.It delivers exceptional performance even in rooms with light courtesy of the higher brightness and square pixel technology. However, if you are a long session gamer, you may be required to pause in between games for it to at least cool. This is my favorite mini projector on this list and takes up the slot for editor’s choice. I know, a lot of people are of the opinion that these cheap projectors don’t last. If you are among this bunch of doubting Thomas, get this projector as it comes with a 3-year warranty and a money back guarantee. I sometimes play from my balcony because of the summer heat and I still get good picture quality regardless of the light that still gets through my blinder. I normally project around 90-inches considering my living room layout won’t allow me to go further. However, the maximum you can go is 175-inches from a distance of 15ft. You will realize that this is an upgrade of the earlier model that has 1800 lumens compared to the 1500 lumens in the older models Regarding resolution, it packs 840 x 480p as the native resolution but can still downscale full HD 1080p content. Another thing I like is its versatility; I listen to music and watch movies using it, the only downside is that it lacks speakers. But for me, I am an audiophile so even with a high-end TV with Dolby, I will still need my home theater. This is a great mini projector for anyone looking for crisp images in rooms and ambiance with a lot of light. The 1800 lumens brightness and 1080p maximum resolution make it a great choice for viewing a range of multimedia content including music and movies. Considering the 40000 hours lamp life and $85 price tag, it is a deal you shouldn’t miss out on. If you play for very long hours, then I would recommend this projector because of its special design that improves air circulation in an around the projector for faster cooling. Besides, it has an efficient fan that works without emitting a lot of noise like Crenova XPE460. Also, unlike the rest of the projectors that can strain your eyes as DBPOWER incorporated some form of antiglare technology like in HP laptops. Just like the rest of the projectors, we have reviewed, DBPOWER has a native resolution of 800 x 480 but can support up to 1920 x 1080. I also liked its throw ratio that allowed me to project a size of 32-inches to 175-inches even in an averaged sized room. Compared to your ordinary mini projector, the 1800 lumens guarantee bright images, perfect for backyard viewing. However, for the best experience, I still insist you use it in dark ambiance. Regarding connectivity, it is also impressive considering it had no problems using TV sticks, Chromecast, USB 3.0, HDMI, SD card and VGA for old PCs. The T20 has the longest lamp life among the projectors we have reviewed. It can clock 50000 hours and comes with a 3-year warranty. If you want value for money, I highly recommend that you get this projector. It delivers excellent picture quality for an 1800 lumens mini projector and has a very long lamp life. Besides, the 3-year warranty will cover you long enough in case it develops some malfunction. Now that we know about the top 5 best gaming projectors in the market, it’s time we give you a few tips that will guide you when shopping. But just before that, let’s look at how projectors and TVs compare. Is a projector a worthy investment? Is it better than a TV or monitor? We are going to answer all that in this segment. Perhaps the best approach will be to look at the advantages of a projector over a TV or monitor. You will agree with me that a projector offers quite a number of advantages and that’s why the number of gamers switching to this display option is overwhelmingly growing. Here are some of the things that make them popular. The cheap cost may not be a strength for projectors but it is worth mentioning that they are cheaper compared to TVs. While a 70+ inch TV may cost you an upwards of $2,000, you can still get the same big screen gaming experience for just $100 with a projector. However, note that the quality may not be as good as a TV but again, if you step up your budget, you can get some quality picture with a high-end projector like. Another important advantage of projectors over TVs is portability. While it may be hard to carry a TV around, a projector can be tagged along easily ready for gaming anywhere, anytime. On average, a gaming projector weighs around 5 lbs. while even a small 32-inch TV will weigh up to 10x more. Besides portability, projectors are more space-saving courtesy of their compact design. You can actually project a 100-inch display from a small compact box, the size of a TV box. In as much as projectors seem to be the ultimate alternative to the pricey big TV screens, they are not invincible. Here are aspects you need to compromise on when you buy a projector. There’s some hype in using projectors but unfortunately, their performance is not as good as a TV’s. Even with the best high-end projectors, you can’t get the same crisp picture quality as in high-end UHD and 4K TVs, the likes of TCL 55S403 LED 4K and Samsung UN55MU8000. However, with keen and deep researching, you can still land on a good projector that won’t let you down. Another major shortcoming with these displays is that they work best in dark environment. During the day, in rooms that can’t block the outside light completely, the picture is pale and very unappealing. 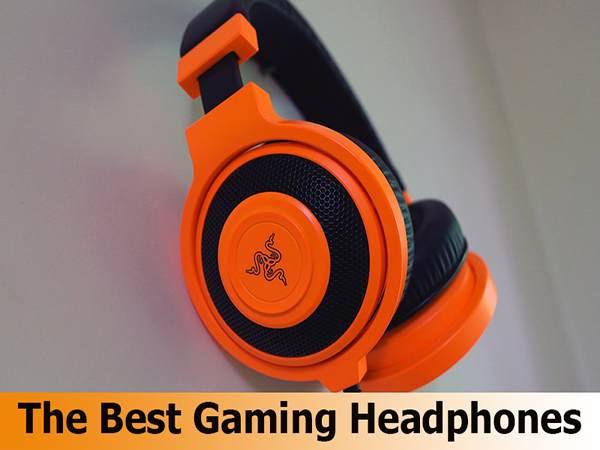 When it comes to sound, you will also have to sacrifice the balanced sound of TVs if you don’t have a home theater system or rather, a gaming headset. However, even though projectors may not offer the best picture and sound quality and require dark environments to work properly, they are still a worthy investment. For most gamers, what matters most is the size and this is exactly what projectors offer. 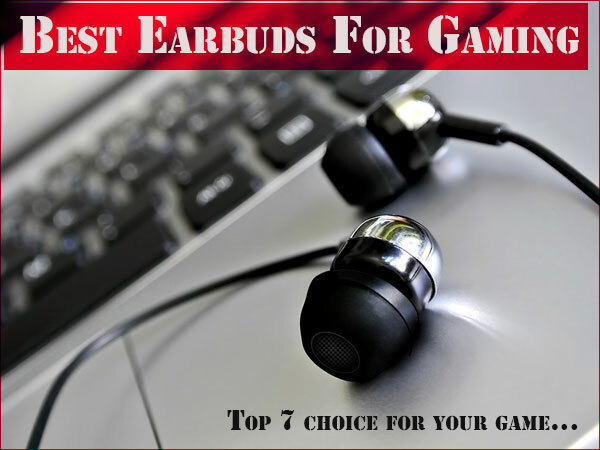 As long as you set them up at the most appropriate distance and using the right accessories, gaming can be more thrilling and highly immersive. I will tell you that price should be the major determinant of what projector you are going to buy. 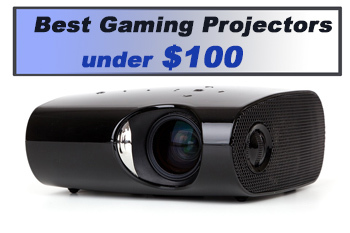 The good thing now is that you have narrowed down your mind to a projector under $100 so the question is, what do you need to look for in these projectors? Here are some of the most important factors you need to consider before paying for any of them. This is a critical area that you should not miss out on when buying this equipment. Projectors come with different inputs so you need to make sure that the display output of your console, PC or gaming desktop is compatible with the projector of your choice. 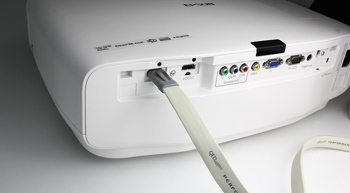 While HDMI is now the main input provided by most projectors, you may still find some with VGA and DVI ports. Nothing can be worse than receiving a projector that lacks the crucial connections you need. This may force you to spend some few extra dollars for connectors, converters, and bridges. Often, you will hear manufacturers describing their projectors in lumens. Even though it looks like a very complex aspect, it simply refers to the brightness of the picture. Unknown to many, there are 2 lumen specifications; color brightness and white brightness. However, you will notice that some manufacturers don’t give the details of both and will only include one lumens rating in their specifications. In such cases, this represents the white brightness of the projector. Typically, the color brightness of that projector will be something to do with 33% of the brighten lumens stated. The big question is, what’s the effect of lumens in picture quality? You will realize that the number of lumens you need will be determined by ambient light. Ideally, projectors are meant to work in totally dark rooms, a condition that is very hard to achieve. So, what you need will be more lumens to withstand the ambient light and still deliver crisp images on the whiteboard. Regardless of where your venue will be, it is always best to go for a projector with higher lumens. This refers to the ratio of the luminosity of the darkest black and white. This cuts across all the dark and light colors. For example, a projector with 1000:1 as the contrast ratio means that the brightest white is 1000 x brighter than the darkest black color. With this in mind, it is clear that contrast ratio is a key factor that determines whether the projected images will look sharp or not. However, I wouldn’t advise you to focus much on contrast ratio because several other factors greatly define it. First, ambient light may deem a high contrast ratio useless. Many are times in rooms with ambient light, that you won’t be able to differentiate the opponent’s uniform from yours when playing in light colors. So, in as much as higher contrast ratio is always the best, it is not a factor that you should dwell on so much. This refers to the ratio of the projectors width to its height. There are several aspect ratios that are available with projectors. We have 4:3 which is what you get on most computer displays, 16:10 for commercial purposes and 16:9 for widescreen TV shape. Even though old titles relied on 4:3 aspect ratios, the latest titles require 16:9 for the best viewing experience. Even though most projectors will allow you to interchange between these aspect ratios, be wary of some with fixed aspect ratios. You have probably heard of resolution; whether it is in a TV, camera or even projector. The resolution simply refers to the number of pixels used on a screen to display an image. It is represented by a combination of a number like 1024 x 768. This means that there are 1024 pixels horizontally and 768 vertically; the more the pixel density, the sharper the images. Together with size, this is the most sought-after aspect that informs customers when buying displays in general. Most projectors nowadays have moved to 1024 x 768 courtesy of the development of HD. However, you will still find a few entry-level projectors with 800 x 600 for example, pocket projectors. For gaming, I would recommend that you don’t go lower than XGA (1024 x 768). You will find that even though SVGA projectors like RAGU Z400 might support input of 1080p content, it is downscaled and you end up with a low-quality picture that won’t suit heavy titles like Forza, FIFA, GTA and so on. For the best gaming, especially AA and AAA titles, I highly recommend that you get a projector with at least Full HD resolution or even 4K if the budget allows you. There are two main projector technologies; 3-chip 3LCD and 1-chip DLP. It is important to know their differences when shopping for projectors. 1-chip DLP employs a spinning color wheel for rendering the color schemes of content; this ends up with exaggerated colors. On the other hand, 3-chip LCD technology is more advanced and delivers natural colors with no exaggeration of white and color lumens. If you are playing high-end titles with the latest picture engines, I highly recommend LCD projectors. 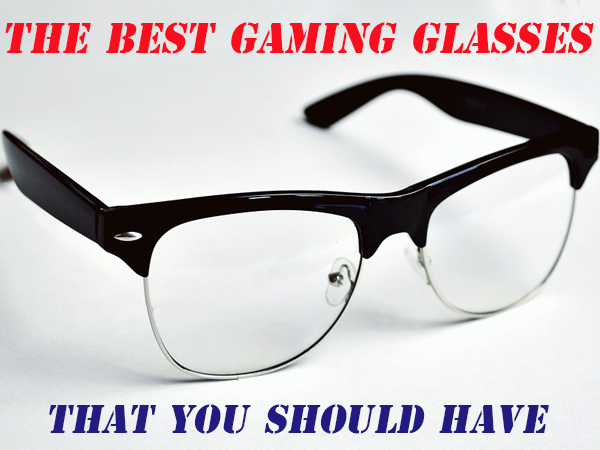 This is another important factor that you should consider with regards to the size of your gaming room. It simply refers to the distance between your projector’s position and the screen. There are projectors meant for long throw distance while others are for short throw distance. For gaming, I would recommend shorter throw distance because definitely, you are not in a gaming hall. Projectors work by sending a beam of light to the whiteboard or screen. 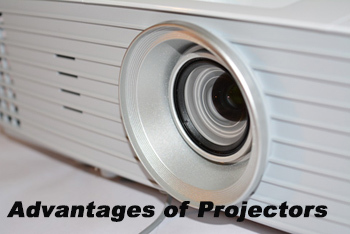 Projectors can be classified into 3 different types depending on the type of illumination. We have standard lamp, laser and LED projectors. 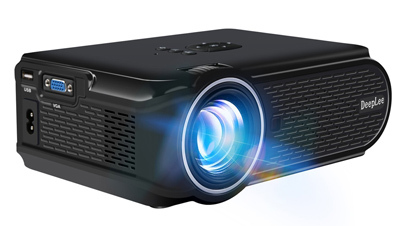 Standard lamp projectors are quite popular because of their affordability. However, the lamp will need replacement after around 4,000 hours. 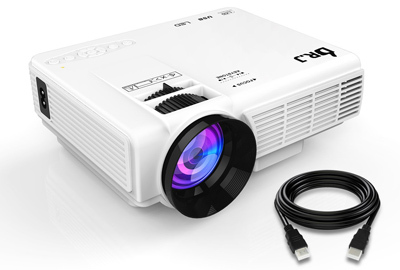 With the advancement of LED technology, LED projectors are also gaining popularity really fast. Their advantage is they deliver brighter and clear images than standard lamp projectors and most importantly, can last for around 20000 hours. From the fact that they use very little electricity, they don’t require a fan so at the end of the day, they will have a minimalistic design and that’s why most pico projectors use LED illumination. Lastly, there is laser illumination which delivers the best picture quality and requires no bulb replacement like the rest of the projectors. As the name suggests, this refers to the hours a projector can work before the lamp dies out. Different projectors come with different lamp life. Even though the longer the lamp life the higher the price, it is important to strike a balance between the two in order to get value for your money. Besides this, also check the price and availability of the replacement lamp. I know a lot of guys who bought very cheap projectors but after the lamps died, getting the replacement lamp was very hard or quite expensive. For example, if you buy a $100 projector, it would be insane if the replacement lamp costs $50. The good thing is that there are several manufacturers like Pureglare that are now making universal lamps that are compatible with several other brands. This is not very important but again, it is worth checking out for some extras. Today, there are several extras that projectors can come with. Features like 3D, wireless capabilities, interactivity, among others can be of value but will definitely step up the cost. But now that you are on a budget, this won’t be of importance. 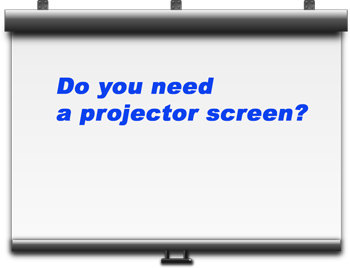 Do you need a projector screen? What no one will tell you is that in as much as projectors just work fine on whiteboards, there are specially made screens that will deliver better picture quality. Even though they will set you back a few bucks, they are better than just any other whiteboard as they reflect all the light thus guaranteeing clear and crisp pictures with all the natural colors intact. For most gamers, getting a big display is a real headache when trying to set up a gaming station. But now, with the coming of really cheap gaming projectors, big screen gaming is now very possible even on a budget. If you want to play FIFA with a life-size Messi or driver Forza in an almost real size road, get a projector today and make your dream come true.